FileVerifier++ is a Windows application for verifying the integrity of files. FileVerifier supports various algorithms by means of dynamically loadable hash libraries. It uses the Windows API and doesn't have any dependencies other than what comes with Windows (WinFVC excluded). Permanent installation is not required and may be burned to a CD or used from a flash drive. In brief, FileVerifier++ should run without problems on the following operating systems. The current binary build supports wide characters internally (2-bytes) and utilizes the Unicode versions of the Windows API calls. Thus, this version will not directly execute on Windows 9x as it does not support these functions. I did create an ANSI build of FileVerifier (ANSI here is Microsoft's terminology, not mine), and that build does appear to work on Windows 98, though on my test system (VMWare Server), it appears to hang upon termination. The same "ANSI" build executes on other operating systems without issues. Upon further debugging, it appears to be hanging upon returning to a 16-bit device-driver call, so it may be something to do with VMWare's drivers being installed in the VM. More to come on this one. Can load and save results to and from various formats. Hash algorithms can be added through the DLL interface. Hash verification. Can load hash results and compare to what is actually on your disk. Verification considers file size, file attributes, and modification date to be significant. Search and grep using regular expressions. Can be installed using installer or without. The FileVerifier++ Shell Extension is a useful addition to FileVerifier++. The extension adds a context-menu handler to Windows Explorer that allows one to hash a set of files and/or directories. The menu allows one to choose between the default hash algorithm and each installed algorithm. 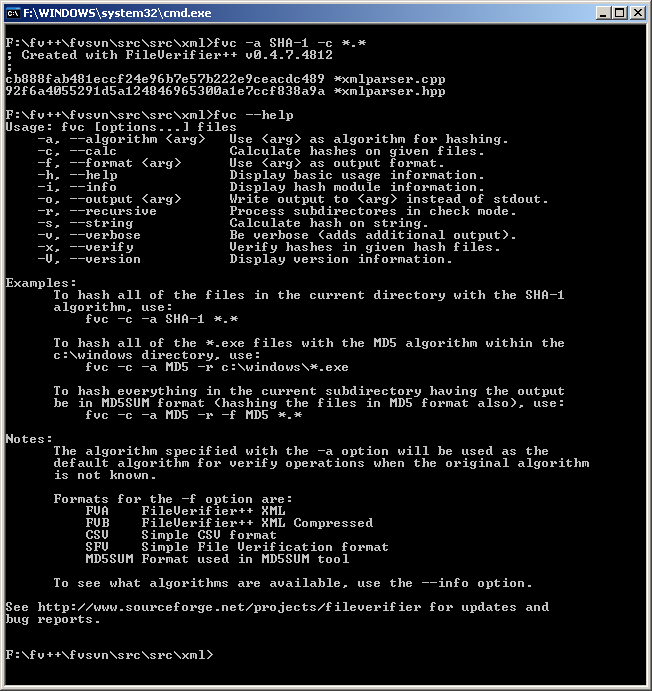 FileVerifier++ now comes with a non-interactive, command-line hashing utility called FVC. FVC supports all of the hash algorithms and input/output formats that the FileVerifier++ GUI application supports, as well as simple recursive hashing with standard wildcards. FVC also has the ability to verify multiple hash files, even recursively. The command line version is available starting with version v0.4.7.4812. The ability to verify multiple hash files in the GUI version. on certain systems has been applied. when an item only contains a filename. has been replaced with one that actually has an "X". * Customization of displayed columns and the column order is now possible. empty buffer has been resolved. tagging requests has been resolved. * WinFVC, an experimental frontend to FVC, has been added to the project. files. WinFVC requires the Microsoft .NET framework 2.0.
however, as FV++ always hashes in binary mode. leave the configuration on the system in which the program is running. SHA1 hashes in a file ending in .MD5). between applications (such as RMD160 vs. RIPEMD160 vs. RIPEMD-160). and can be edited if necessary. file, such results would not read back properly. This has been fixed. being processed. This has been fixed. are not reported as being nonexistent has been fixed. with older versions of FV++. This may change later on. work whether or not Windows XP visual styles are enabled. previously, Ctrl-<Enter> needed to be used to enter multiline comments. from STLPort to libstdc++. This is now fixed. to select the correct format unless one uses the "Auto Detect (*. *)"
selection in the load results dialog. files though, as each hash module now specified a list of alias names. compiler, as v0.5.2.5113 tends to crash when terminating threads. versions supporting the message log. This has been fixed. relating to successful loading of the file. be salvaged, those ones will be loaded. * Comments for FVA/FVB files are now displayed in the message log. * Modification times are now displayed with respect to the system locale. * MD5SUM file format now supports only two comment delimiters, ; and #. would be dumped to the message log. be prompted for a comment each time a file is saved. wchar_t to the point where boost wregex will build with it. operate the way it should for the most part. patterns like *.exe should be the same between the two schemes. irrespective of the already existing format. This has been corrected. the hash entry buffer though. when the other ones aren't present). based on the MD5SUM format, so it's not a major addition. as well (plus the *.SHA* ones). advanced processing lists may be saved for reuse at a later time. where one wishes to choose a set of files to hash via. external means. * Added preliminary version of fvc (command line file hashing utility). 100 bytes in size (hash files, not files being hashed). * Added File Information sidebar. * Added support for EDONKEY2K algorithm. percentage complete in numeric form. the old behavior (where this aspect was ignored completely). files was lost. It has been restored again with this release. Unix-style line endings, provided that this option is selected. (i.e. using the -march option). tranfering entries from one instance of the program to another. * Various other internal changes have been made. * Most recently used list has been added. * Fixed some GDI object leaks. * Support for SFV file format. to the location of the checksum/hash result file. something that I've been wanting to support). * Improved CSV file parser. * Various other miscellaneous modifications. to be). This has been fixed. * Removed duplicate entry for JamCRC in the CRC module. * Made several improvements to the Makefile (doesn't concern binaries). v0.2.0 when Unicode support was added. menu, causing duplicate menu entries to appear. Fixed. for an algorithm when resources are limited. Fixed. * Shell extension had a directory handle resource leak. Fixed. * Additional variants of CRC32 are now supported. installer and use it as usual. * Fixed a few issues with XML file generation. two times faster on large files. displayed in UTC. This may change in the future. * Added support for FVA (XML) and FVB (Compressed XML) formats. * Added support for Windows XP visual styles. * Toolbar icons have been improved. after loading an existing file. provided public key may appear in the future. -> CSV, Anything else is assumed to be a text file in md5sum(3) format). * Fixed a bug with the initializing of the Microsoft Crypto API.